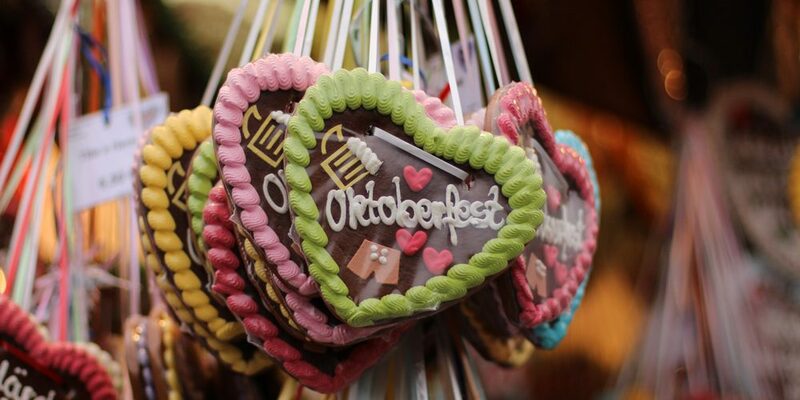 The Oktoberfest is the world’s largest funfair held annually in Munich, Bavaria, Germany. It is a 16-day festival running from late September to the first weekend in October. 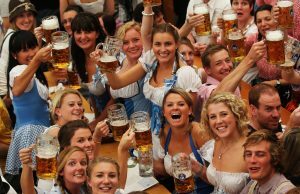 Every year there are about 7 million visitors to the 42 hectare Theresienwiese, who consume 1.5 million gallons of beer, 200,000 pairs of pork sausage, and 480,000 spit-roasted chickens during the two-week extravaganza. 72% of the people are from Bavaria. 15% of visitors come from foreign countries like the surrounding EU-countries and other non-European countries including the United States, Canada, Australia and East Asia. Most of the visitors are dressed in typical Bavarian clothes, in Dirndls and Lederhosen. Liter, Maß, Hoibe – how does that work? Pork, chicken or oxen. Roast pork is usually served with dumplings made from potato-dough and a very hearty sauce. The same goes for the oxen. A very popular Bavarian snack is half a chicken. The important thing is the skin of the chicken, which is extremely well-spiced and should always be very crispy. In Bavarian it is calles “a hoibads Hendl”.